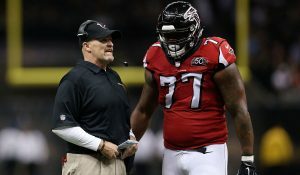 The Atlanta Falcons have ended the contract of Ra’Shede Hageman a 2014 pick in the second round. The defensive tackle was arrested in 2016 on charges of domestic violence that stemmed from allegations made by a girlfriend he had at that time. In a prepared statement on Monday, the Falcons announced that they had released Hageman with one year and over $1.1 million left on his current contract as a decision by the organization to move ahead, after an investigation process by Atlanta authorities. According to a report from police in Georgia’s DeKalb Country, Hageman was facing misdemeanor charges of cruelty to children, battery, and the interference of calls for an emergency that stemmed from an incident in March of 2016. The NFL put Hageman on its Exempt List made by the Commissioner due to the charges being related to domestic violence that were filed by DeKalb County prosecutors. Criminal proceedings concluded the latter part of August, while the league’s investigation was pending, said NFL officials. Atlanta became aware of that incident in March but did not address it until September publicly. When asked about it last September, Hageman said he could not say anything about it since it was ongoing and would allow his lawyers to handle it. At that time, Dan Quinn the Atlanta coach declined to say anything specific about the incident. He said that at the time, that the team was aware of the serious allegations made by the woman and under the player conduct policy the team could not make any comment relative to an investigation that was undergoing. However, the team is aware of the allegations, but will not make any further comments until the NFL reaches its final conclusion and all facts were brought forward. Quinn will likely address this issue when Atlanta concludes its practices on Monday afternoon. The Falcons defense added players during the offseason as that side of the ball was one of the weaker parts of the team last season, even though Quinn is known to be one of the best defensive minds in the game. The Falcons will open their regular season this weekend in defense of their NFC Championship title and subsequent loss to New England in Super Bowl LI. Odds makers have projected the Falcons to once again win the NFC South, but they are not predicted to repeat as NFC Champions.